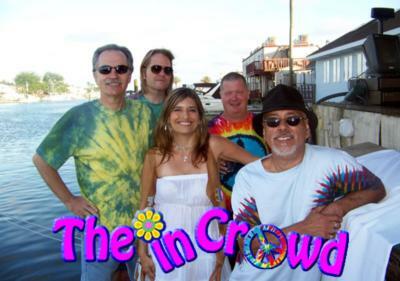 The In Crowd is a high energy party band that highlights all your favorites from the 60s and 70s eras. Our Song list is extensive, covering these artists and so much more. Aretha Franklin. The Beatles, America, Joe Cocker, The Mammas and the Papas, Janis Joplin, Hendrix, Patti Labelle, Carole King, Journey, The Eagles, Nancy Sinatra, Crosby Stills and Nash, Carly Simon, and so much more. We represent ALL of the 60s and 70s. The bands dance sets are off the hook with the funkiest r/b of the eras. The harmonies are amazing, with 4 parts. 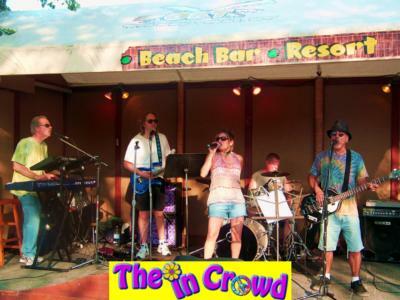 It's like a concert for your event. We take requests and will learn any songs you wish to hear for your affair. We are professionals and cater to every detail from how the band looks, sounds, pleases your guests and even to our volume. You won't have complaints about loud bands who won't turn down. We get it. It's your event. Please give us a listen, a look and a shot. You won't be disappointed. Please note The In Crowd will also travel to Hauppauge, Commack, Kings Park, Nesconset, Saint James, Brentwood, Central Islip, East Northport, Lake Grove, Ronkonkoma, Stony Brook, Centereach, Islip Terrace, Bay Shore, Bohemia, Northport, Centerport, Deer Park, East Islip, East Setauket, Greenlawn, Holbrook, Holtsville, Huntington Station, Islip, Oakdale, Selden, Brightwaters, Farmingville, Great River.